Tired of lugging around those gallon jugs of pool shock? Tired of having to wait long periods of time while the chemicals get down to safe level? 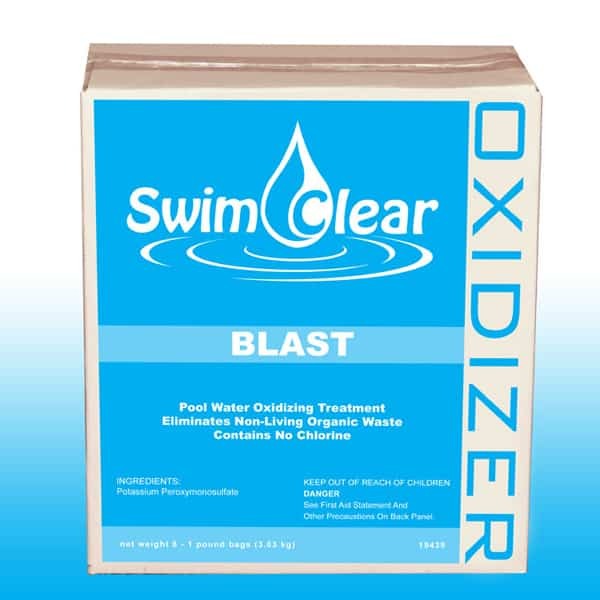 Well all that goes away with Blast chlorine free pool shock. This product only needs to be added to the pool once a week and can be added before the party instead of after. This type of shock works as an oxidizer to free up used chlorine and bring the chlorine that is already in the water back to life. As with all water maintenance programs, be sure to check the pH and Alkalinity and keep your chlorine residual at the recommended level. With Blast, you can enjoy the pool all summer long instead of having to work on it. Perfectly clear and clean water, made easy with Swim Clear. Family Leisure is your pool supplies headquarters. With all the fun to be had this summer, how are you going to spend your time?